Imagine a jacket potato stuffed with all of your favorite toppings. That's what yo get with the recipe below – but with a soup! The creamy potato base is the perfect jumping off point for a host of delicious flavors like bacon, cheddar, green onion and sour cream. This soup starts by cooking potatoes until they are nice and tender. Blitz them in the blender with some cream and seasonings, then top with whatever toppings you prefer. 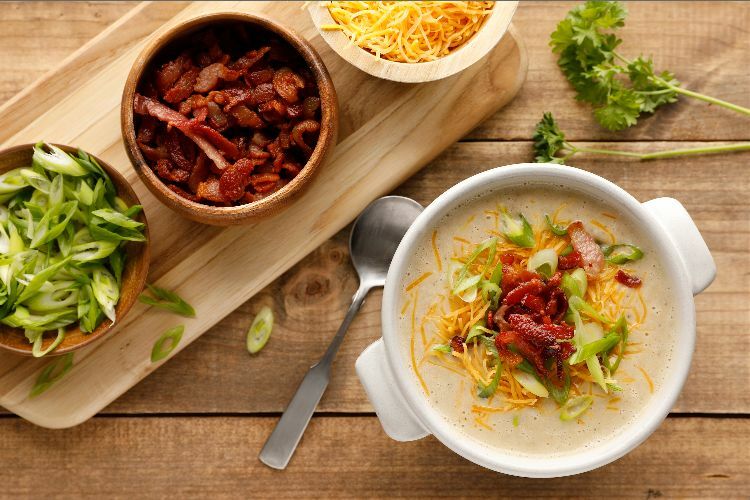 We love serving up bowls of the creamy soup plain and letting everyone at the table dress up their individual serving the way they like it! Scatter the bacon in a cold Dutch oven, then heat over medium heat, stirring occasionally, until the bacon has rendered its fat and is nice and crisp. 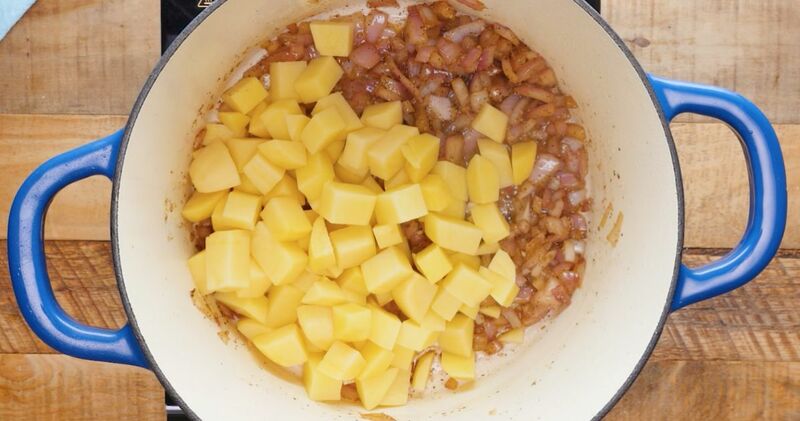 Remove the bacon and set aside, leaving the fat in the pot. Add the butter and the onion. Season with salt and pepper and cook, stirring occasionally, until soft and slightly browned, 12-15 minutes. Add the garlic, potatoes, chicken stock and thyme. Bring to a boil, then reduce to a simmer and cook for 25 minutes or until the potatoes are very tender. Remove the thyme. Add the half and half and blend the soup using an immersion blender until very smooth. Season the soup to taste with salt and pepper. Ladle the soup into bowls. Garnish each with a sprinkling of reserved bacon, cheddar and chopped scallions, and a quenelle of sour cream (or serve the garnishes on the side and let people make their own bowl).